It’s probably a lot easier than you might’ve imagined (if you haven’t been doing it all the time anyway) to make an excellent pesto. Throw them all in the food processor and turn it on. Toss with your choice of pasta, chicken or fish. 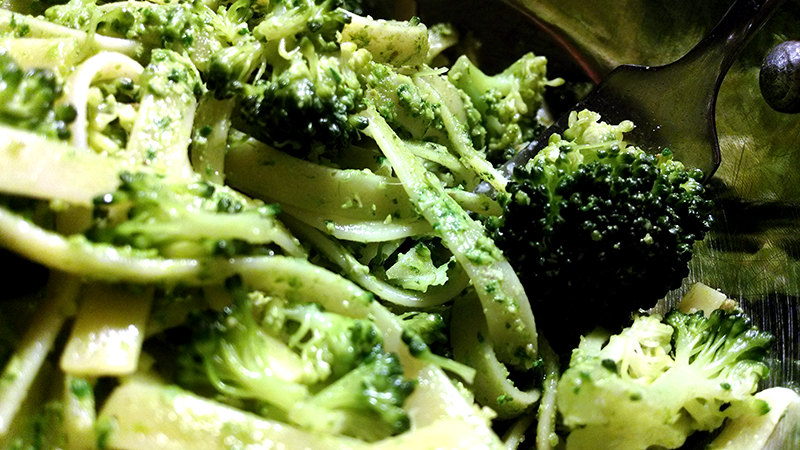 Above is actually the spinach pesto tossed with linguine and some steamed broccoli florets. Last night we got home from an afternoon of errands and were too tired to make a big fuss. 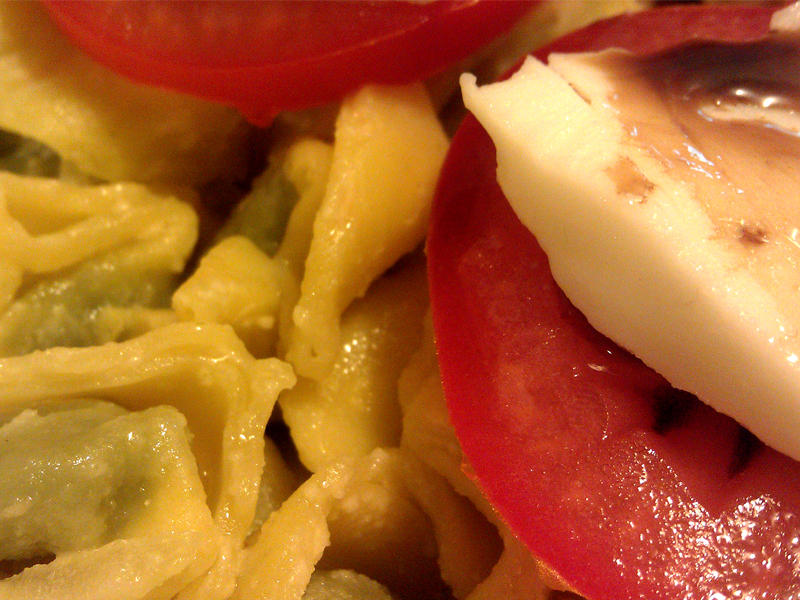 I was able to get the pesto ready by the time our box of mini-pierogies were done. My wife drained them and handed me back the empty, still-fuming pot. I spooned inabout half the food processor’s aromatic goods and smeared it around to heat/loosen it up (feel free to add an extra dollop of oil if you find it too stiff). Then, with the pasta: drain the linguine while al dente, and put it back into pot; mix. 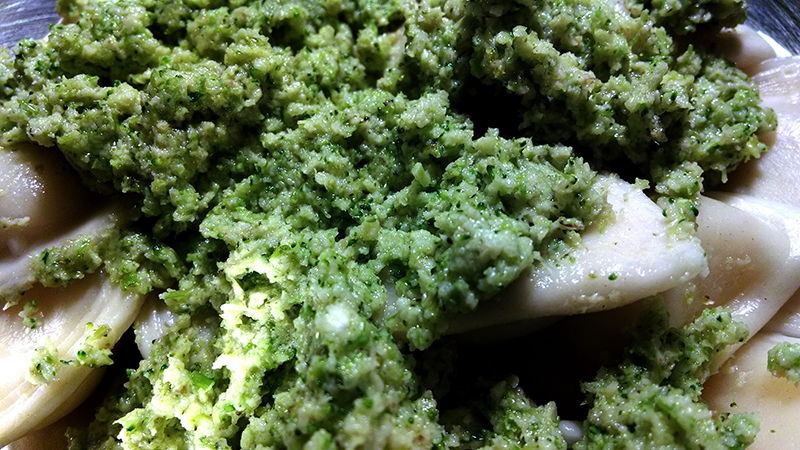 With the pierogies, we just spooned the broccoli pesto atop their delicate, easily-offended skins. This new addition to my current recipe lexicon gets 5 spoons with applause for being so easy, delicious and full of protein/good fats and phytonutrients. 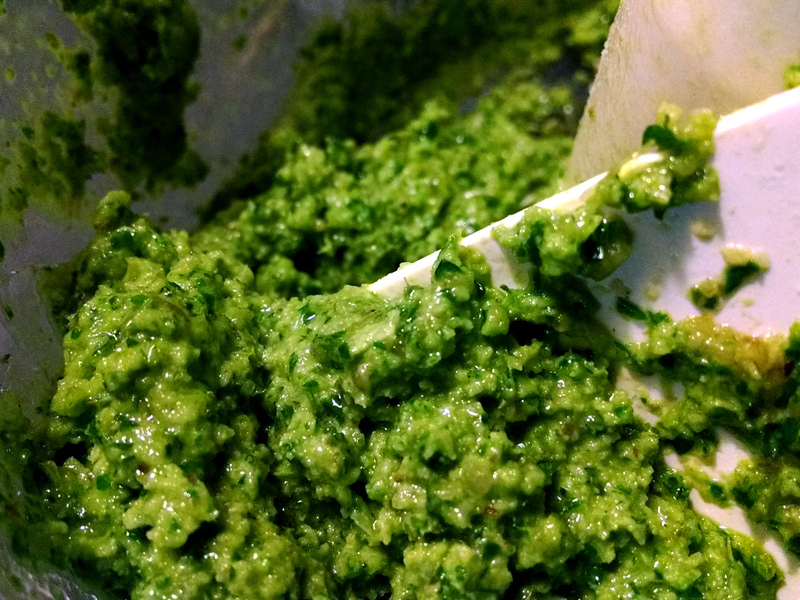 Tonight I’m using the other half of last night’s broccoli pesto — the other half of the food processor’s insides never seem to make it to the freezer. Well we had spaghetti sauce and salad stuff, but neither one of us necessarily felt like being transported tonight via flavor to the isle of Sicily. 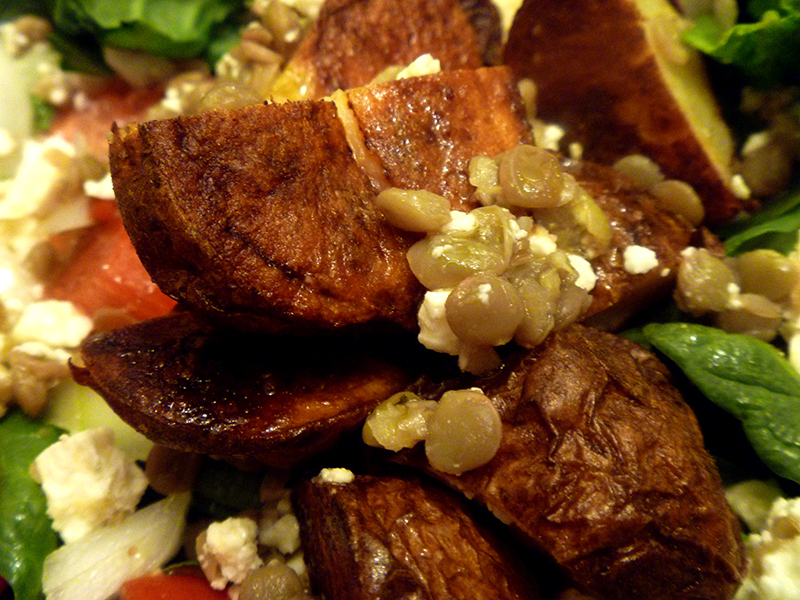 Maybe something a wee bit lighter (-seeming, at the very least) like olive oil and garlic? Then a bulb came on above both our heads at the same moment — pesto! Since kinda-recently learning of coconut oil’s health benefits I’ve been trying to incorporate it into my cooking — the trick there is not to make coconut pasta, so tread lightly. It, the whole wheat pasta and walnuts are the main proteins here (unless you wanna count the Parmesan too, but ’tis a mere pittance), nevertheless feel free to add chicken or shrimp if you don’t believe in things like that. Also, ha! Made ya like kale, right? 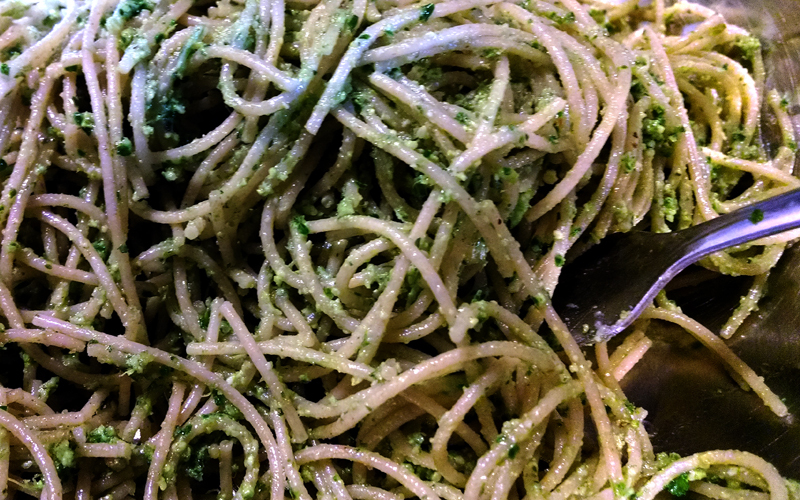 Put all that stuff in the food processor and let it whirl until — magically — pesto appears! Adjust the oil if you want it more/less soupy. With the minimal amount of coconut in a dish that roars of garlic, there was a faint hint of Thai in this dish… just enough to make it delicious and foreign, but not enough to make it taste counterintuitively unfamiliar. I had enough left over from our [2 person] meal that I used 2 tbsp of it to make a pesto vinaigrette (this stuff, red wine vinegar and a little more olive oil) and still had 1/3 c of it to put in the freezer. 5 spoons. Yum. And an easy “yum” at that. So easy that though I didn’t have time yesterday to write down the ingredients today they are still simple to keep emblazoned in the senses. If you haven’t cooked papardelle before, try it out and learn how it got its name from the Italian verb “pappare” (to gobble up). Fry your garlic on ML until just the edges begin to turn golden, then remove the pan from heat and sprinkle on the seasonings. Let that sit while boiling papardelle to the perfect al dente and chopping spinach. When the pasta gets drained, turn off the burner. 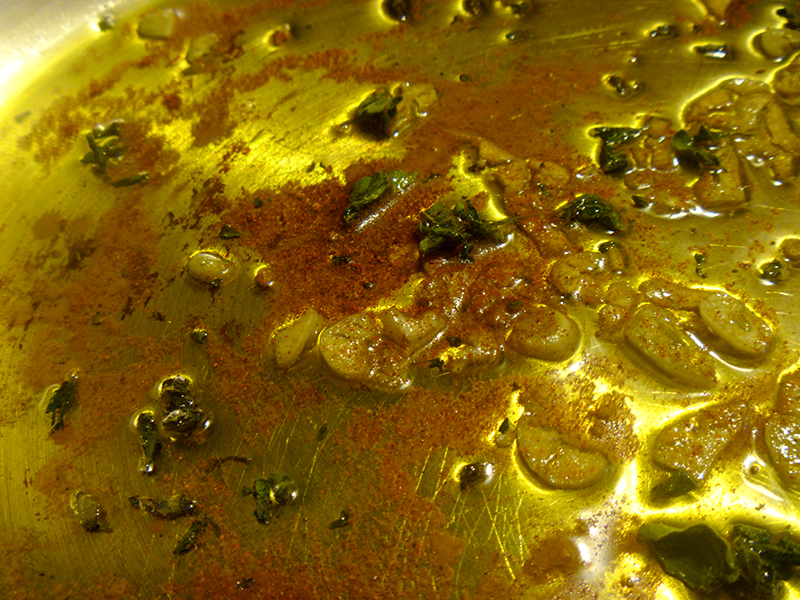 Mix spinach into the oil/garlic/ and move that pan back to the burner you just turned off (don’t turn it back on). Cover the pan for 1m, then uncover and stir until the spinach is wilted to your taste. 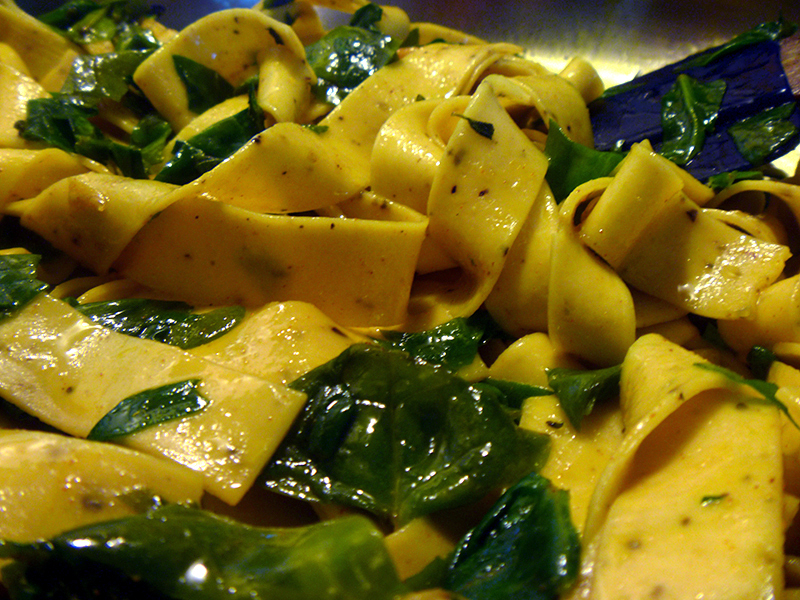 Mix in the papardelle and ensure everything is properly coated. Sprinkle with Parmasean. Between the papardelle, spinach (and Parmesan), this vegetarian dish will have more protein – and visual interest – than eating a chicken breast. Of course that doesn’t mean you couldn’t add meat if you want, or skip the cheese for an easy vegan dish. 5 well-deserving spoons! 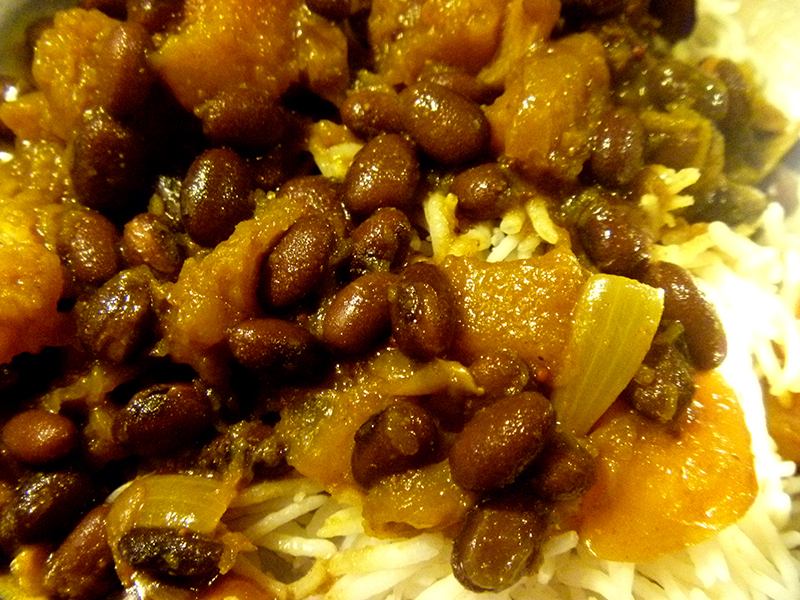 Sorry if you feel tricked after the title by now reading something about black beans and butternut squash… technically, I do not feel ethically bound to do more than reassure you that both things mentioned in the title of this post are in this meal. Stick with me though, sad faces — I will not disappoint! 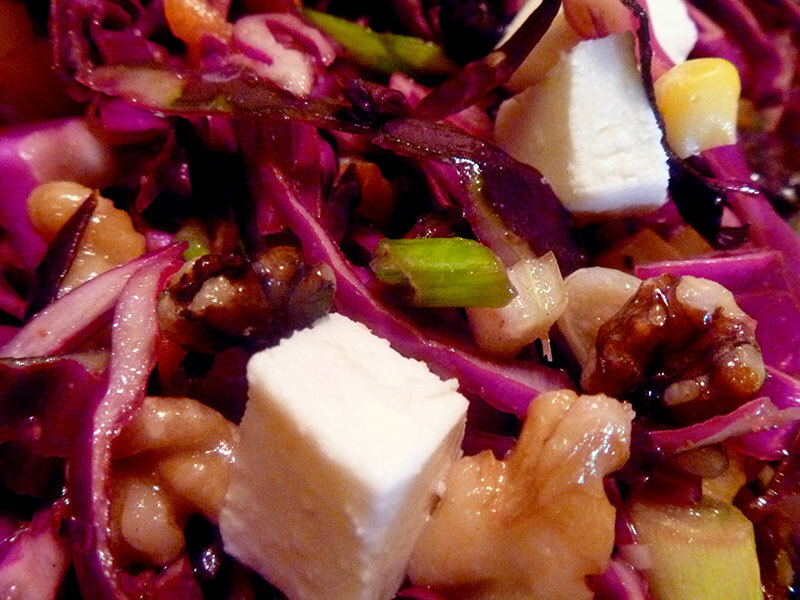 Grapeseed oil has a very nice, light nutty flavor that comes across a lot more chaste than extra virgin olive oil. Turn the stove onto ML and let the onions/garlic cook for about 10m, then reduce heat to L, add the mustard seeds and walk away for an hour. Ready and set out the rest of your ingredients, wash some dishes, tidy the downstairs bathroom… you know, normal weekend stuff. When everything has paled in the pan, increase heat to M. Add all spices (except cocoa powder) when mustard seeds begin to crackle and mush everything together. Add a splash of water to create a friendly mash then add in the squash. Mix-toss that junk over M heat for a few minutes, scraping the pan and adding nominal splashes of water when needed. When you might need to add a second or third splash of water, go ahead and substitute that undrained can of beans and 1/2 c white wine (Sauvignon Blanc used). Mix in the cocoa, bring everything to a light boil then reduce heat to L, cover and leave for 30-60m (depending on how tender you like your squash). When you come back to see a more liquidy sauce than you’d expected, fear not! Smash some of the squash cubes and mix to thicken the sauce. Serve over Basmati rice for 4 spoons of spicy, sweet savoriness. So I’ve been hanging out for the last week with my good friend Rhinovirus, who brought along his girlfriend Anosmia. By the time I could yank my snotty face up out of bed, there was nothing left to smell. I probably don’t need to reiterate what a bad idea cooking without smelling is; probably more for whomever is cooked for, but fortunately I was pliable enough in illness to allow more prepackaged food into my kitchen than I might want to for the next six months. 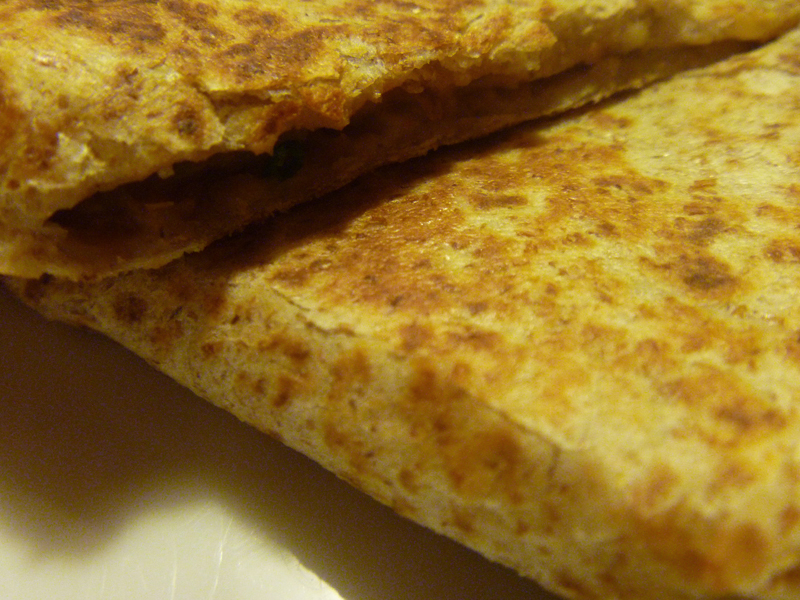 Tonight I’m stepping gingerly back onto the stovefront with something so simple not even an anosmic monkey could fail. Start by slicing your garlic very thinly and letting it simmer in 2 tsp on ML for 15m or so while you mince that kale. 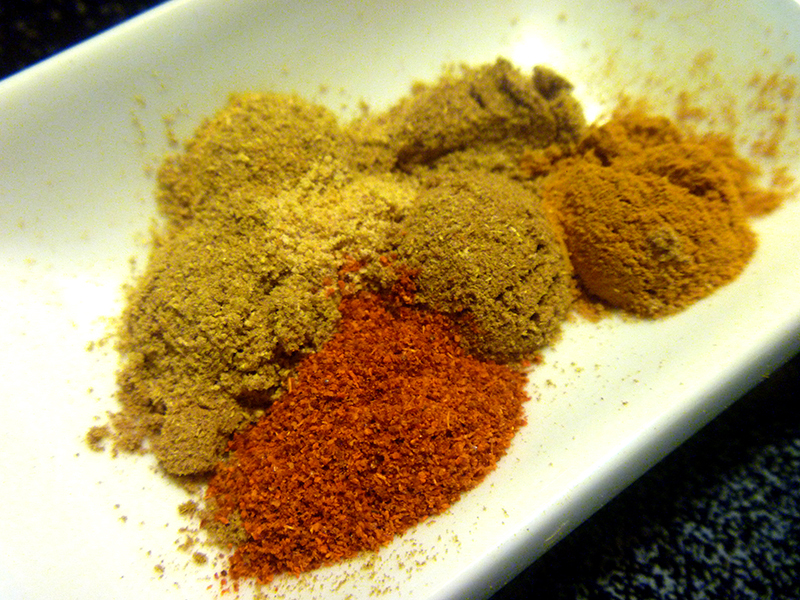 After mincing, sprinkle with and cayenne then rub 1/2 tsp olive oil into your palms and grab the whole bunch. Massage then transfer to a ziplock bag for more massaging. Set aside for at least 15m, but for an hour or more if’n you got it. Shred and mix cheeses. Mix refried beans into olive oil/garlic mix and let everything congeal together on L for at least 20m, but for an hour or more if’m you got it. When kale-sadilla time happens at last, lightly oil a pan heated to the M side of ML. While the heating is going on, spread some beans on a tortilla and sprinkle on a bit of kale for good measure since it will stick with a purpose to the beans and not get all over the counter or stove. 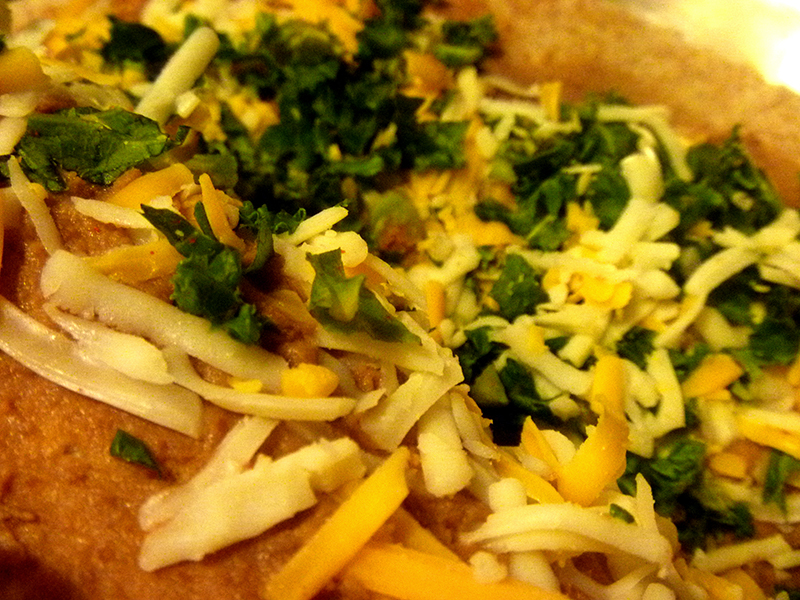 Put the open tortilla in the pan, sprinkle in cheese and fold it closed. Flip it every 15-30 seconds until cheese begins to show, melted, around its edges. Serve with sour cream and salsa if’n you desire. 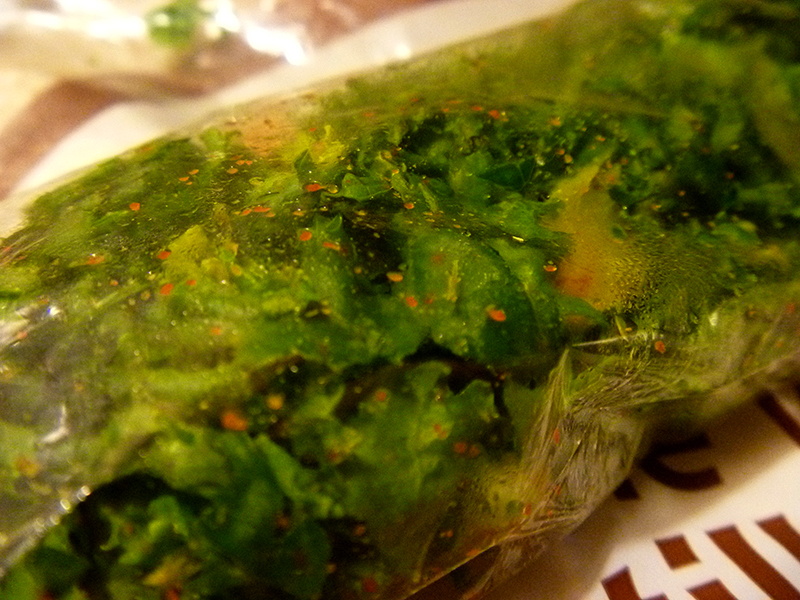 This turns out to be a great way to sneak kale into a meal without knowing you’re chomping the superfood! 4 spoons, says my wife, who has all of her nasal faculties intact. May I Curry Your Flavor? Looking for — or didn’t know you were looking for — a spicy new sauce for pulled chicken or pork? Tailgate dishes becoming a little predictable? Don’t usually cotton to curries? Give this a try for more kick than curry. Start onion and garlic in melted ghee on the L side of L for at least 20m. Sprinkle in the mustard seeds and increase heat to the M side of ML until crackling is heard. Add tomatoes, a dash of broth and cover 5-10m. Chop up your chicken and spinach, set aside. 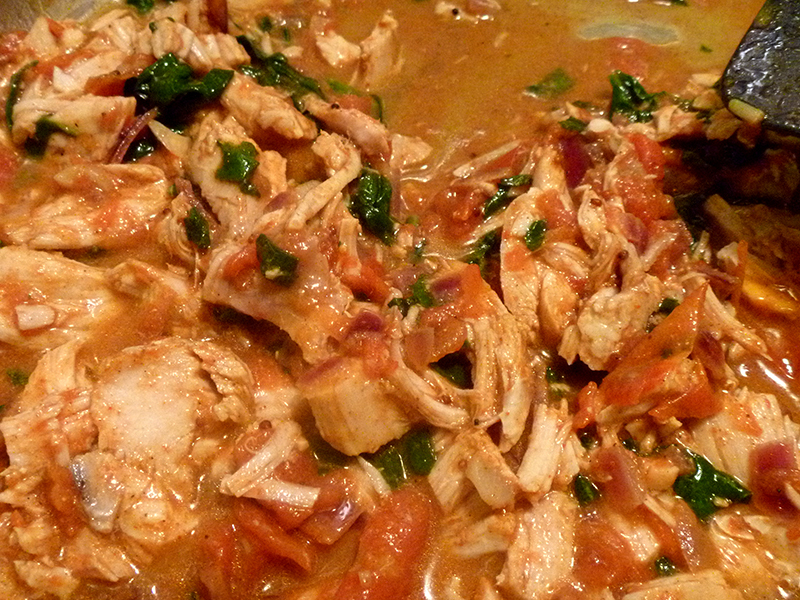 Return to the pan and crush those tomato bits with your spatula, adding the remainder of spices. Mix, mush and gently pummel everything before adding in the spinach. When it begins to wilt upon stir, add in the rest of your liquids, stir well, then add in the chicken. Do some more stirring well while it comes to a boil on M. When it does, cover the pan and turn heat back to the L side of L. Let sit and be heated together as one, then enjoy on a bun or over rice for 5 spoons of flavor. I forgot to take photos of this meal, so here is a picture of the most tantalizing of all nutmeats. 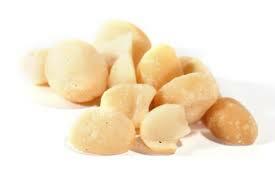 First and foremost, thank you mom for the bag of macadamia nuts that in part went to the making of the macadamia nut butter that makes this dish great. I don’t have a specific magic recipe for macadamia nut butter, but nut butters in general are all pretty similar. Grind the nuts until they are butter. Add a little oil. Maybe a little salt. There was just a little left in the fridge this time, and a little is all you need. Start the onion and garlic in olive oil on ML and let cook 15-20m (depending on your patience), stirring occasionally, then sprinkle with turmeric and stir a little more. Stir in the macadamia nut butter until it melts into a gooey, near-liquid paste, drizzling in the vegetable broth until a thin gravy is made. Add then the entire can of black beans and entire well-drained can of chicken; stir and increase the heat to MH until a boil begins. Before rolling commences reduce to the ML side of L, stir in the cayenne and cover. Let cook another 20-30m. Serve over rice or pasta. 5 spoons!